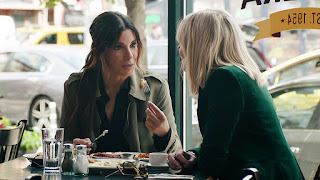 Home / CELEBRITY NEWS / Sandra Bullock Masterminds the Heist of the Century in "Ocean's 8"
Sandra Bullock Masterminds the Heist of the Century in "Ocean's 8"
Debbie Ocean has had nothing but time on her hands for more than five years. And she’s made good use of it. Sandra Bullock plays Debbie, the ringleader of a high-stakes plan in Warner Bros. Pictures’ new action adventure “Ocean’s 8” (in Philippine cinemas June 13). In the film, Debbie has spent a little over five years devising an intricate plot to steal the Toussaint, Cartier’s one-of-a-kind diamond necklace, valued at 150 million dollars. And she plans to do it in the midst of one of the most-watched events of the year: The Met Gala. She knows what it’s going to take—a team of the best in their field, starting with her former partner-in-crime Lou (Cate Blanchett). Together, they recruit a crew of specialists: jeweler Amita (Kaling); street con Constance (Awkwafina); expert fence Tammy (Paulson); hacker Nine Ball (Rihanna); and fashion designer Rose Weil (Bonham Carter). The target is $150 million in diamonds—diamonds that will adorn the neck of world-famous actress Daphne Kluger (Hathaway), who will be center stage at the event of the year, The Met Gala. Their plan appears rock solid, but it will need to be flawless if the team is to get in and get away—all in plain sight. “Ocean’s 8” is distributed worldwide by Warner Bros. Pictures, a Warner Bros. Entertainment Company.